The retail and financial services sectors will continue to innovate via mobile communications. Security is a high-priority in a trust-based economy. Two-factor authentication is based around 1) something the user has (i.e. a bank card); and 2) something the user knows (i.e. a PIN number or password). If a customer needs to log in to their bank account or needs to purchase physical goods online, they may be asked to enter the registered log-in ID and PIN along with a unique 'one time password' that is either sent to the customer via SMS, or generated by a mobile app already installed on the device. Where smartphones are used as access tools, the Bring Your Own Token (BYOT) variant of authentication can be employed, combining a personal log-in (user name and password) together with a passcode, which is sent to the end user in a software app, email or SMS. According to the latest market study by Juniper Research, G&D (Giesecke & Devrient), Gemalto and Synaptics as the leading disruptors within the rapidly expanding field of mobile biometric authentication. Companies identified by Juniper as 'biometric disruptors' are those they perceive as having capabilities to transform the wider mobile commerce ecosystem through the implementation of their platforms. Juniper analysts argue that while the biometrics sector itself is relatively mature, few deployments in the mobile space have achieved a critical mass of adoption -- whether for use in payments or authentication. Juniper highlighted G&D’s historic strength in the wider biometric space allied to an extensive breadth and depth of FIDO-certified solutions encompassing face, iris, voice and fingerprint technologies. According to the Juniper assessment, G&D -- which is increasingly offering its solutions across the mobile environment -- is positioned well to exploit the burgeoning demand for mobile biometric authentication. "With consumers increasingly willing to embrace biometrics as a more convenient alternative to passwords, players that can offer secure, user-friendly authentication platforms could contribute significantly to the evolution of the mobile payment space," said Dr Windsor Holden, head of forecasting & consultancy at Juniper Research. Juniper also recognized HYPR Corp as a catalyst within the field, noting that as a first-mover in the emerging biometric tokenization space -- and with a number of key clients already using their technology -- it's well placed to take advantage of growing interest in further deployments. Mobile biometric payment volumes will triple this year to nearly 2 billion. 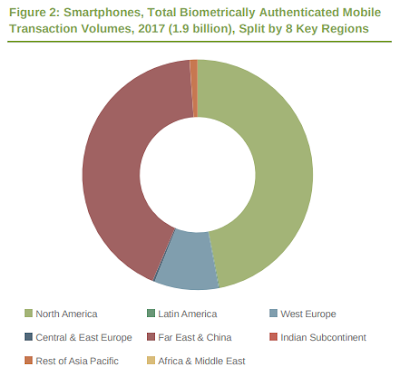 The value of all smartphone biometrically authenticated transactions is expected to increase from $14.2 billion in 2016 to nearly $655 billion in 2021. Apple Pay currently accounts for more than 85 percent of these transactions.